My husband took Gavin (7) and RJ (6) to see Rango on Friday, and I took Liam (5) to see Rango today. My husband enjoyed the movie and all the kids did as well. Me....nope, not a fan. The film is rated PG for rude humor, language, action and smoking. Yeah.... the humor wasn't that humorous, and I didn't like the rude part! I definitely do not feel as if this cartoon was intended for a young audience. I may have enjoyed it if I hadn't had my five year old with me, but it made me uncomfortable to have my child sitting next to me and watching this film....almost like I was a bad parent. My husband said everyone was laughing on opening night, however I only heard the audience laugh a few times the night I went. Perhaps it was because many of the adults had young children with them as well. In the beginning of the movie Rango is acting out a scene with a clothing-less Barbie torso...yet he has a shirt. So, the creators (or whomever) decided that the lizard could wear a shirt, but not this partial doll. I did toy with the idea that Rango had stolen the doll's shirt and that is how he got it, but the shirt he is wearing seems male and the doll was obviously female. Either way, I didn't appreciate it. To top it all off he asks the doll, "are those real?" at one point. There are a few swear words in the movie as well, Damn, Hell, and a reference to B**** are ones that I recall right now. My household is not curse word free, but I feel that a children's movie should leave them out. There is also pretty harsh sayings, such as "I want to look into your eyes as you die". The movie's main teaching point seemed a little off to me as well. This may be considered a spoiler...so stop here if you plan on watching the movie. 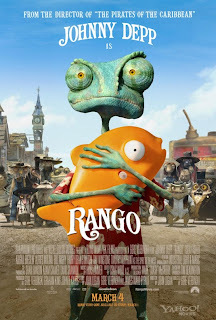 Rango (who starts off not really having a name) decides he can be whoever he wants when he gets to a new town. He lies about himself in order to seem better to everyone. He quickly gains popularity, and through what is, in essence, an accident seems to "prove" himself to everyone and gains "hero" status. I really feel like this is giving children the wrong impression and that they aren't likable as they are...and that it is okay to make up stories in order for people to like you. I also felt the overall story line of the movie was a little harsh. The mayor of the town that Rango ends up in is dictator-like and seems to be "helping" the people, but by the end you see his true colors and how greedy he is (I think most adults got this from the beginning, but the kids did not). The townspeople suffer as the "economy" fails in the town. There is also many references to death and many die in the film. The only thing that I DID enjoy is the graphics. It is visually appealing, but definitely not for children, in my opinion. I wouldn't suggest this movie at all for children under 10, and I would suggest that parents watch the movie before allowing children to if the child is under 13. This review is completely formed of my own opinion. I was not compensated or given anything to write this review. Your opinion of the movie may be different than my own. from the previews I've seen, the movie looked kind of dull. I didn't really have a desire to see it. but now i kind of want to, seeing as it was probably made more for the adults than kids. How did Johnny Depp do as his character? As for Johnny's part, not too bad. 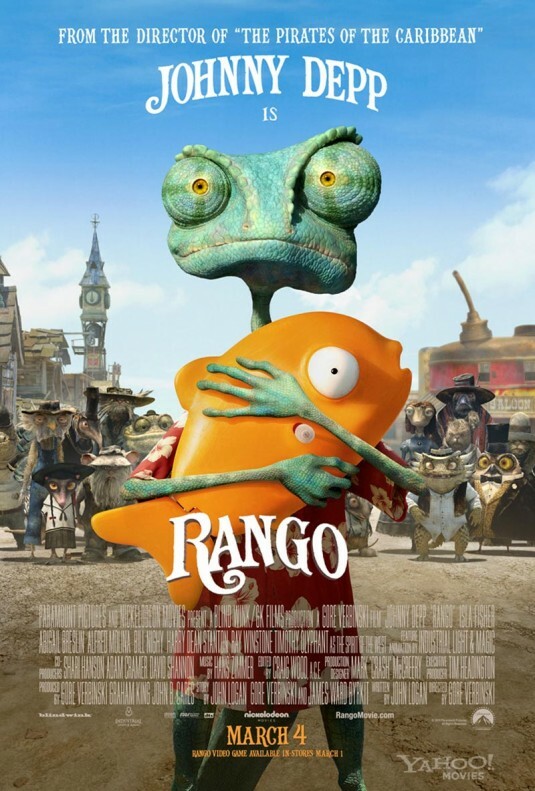 Rango definitely had a "johnny" feel to him most of the time. I prefer watching Johnny, however. My husband took my daughter and he wasn't that impressed either. Disappointing for sure. My daughter enjoyed going to the movies, she always does, but usually she talks about a movie obsessively until we're able to buy it on DVD...I don't think we're going to have that problem this time.